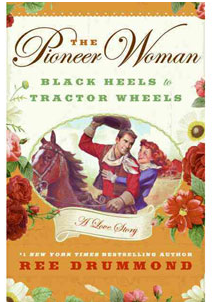 I've been reading The Pioneer Woman for years, so I was excited when I was asked to review her new book, Black Heels to Tractor Wheels: A Love Story. I'd already read much of it as it was posted on the blog but it was a treat to have everything neatly printed and bound in a format I don't have to scroll down to read. 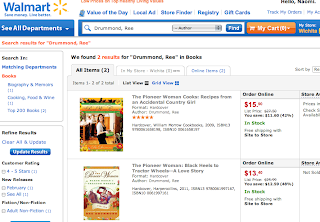 I hadn't picked up The Pioneer Woman Cooks: Recipes from an Accidental Country Girl when it came out last summer, so I decided to splurge and get a two-fer and try my hand at some of her vittles while I read the novel. Comfort food at it's finest, with plenty of great photos and backstories. The story of Ree's courtship with Marlboro Man is enough to make even the most hard-hearted cynic swoon– even if you don't like reading romances, her playful sense of humor and her brother Mike's antics will keep you amused. A must-have for ardent fans of The Pioneer Woman and a treat for newcomers. Disclosure: In accordance to the FTC Guidelines and WOMMA Code of Ethics, I am disclosing that I was compensated for my time and shopping expenses but all opinions here are decidedly my own. I'll be over for dinner tomorrow night. YUM!